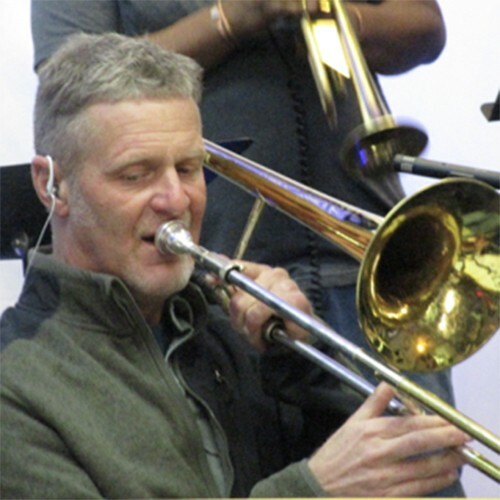 Jim Griffis, Trombonist, Arranger, Music Educator, grew up in New York’s Catskill Mountain Region. He attended Boston’s Berklee College of Music, performing with a variety of jazz ensembles, big bands, Phil Wilson’s International Dues Band, and the Back Bay Bones. Mr. Griffis attended Graduate School at the University of Colorado. Since living on the Front Range, Jim has performed with a variety of academic ensembles, community ensembles, and churches throughout the metro Denver region. He has been a full time public school band director in the Boulder Valley since 1997.